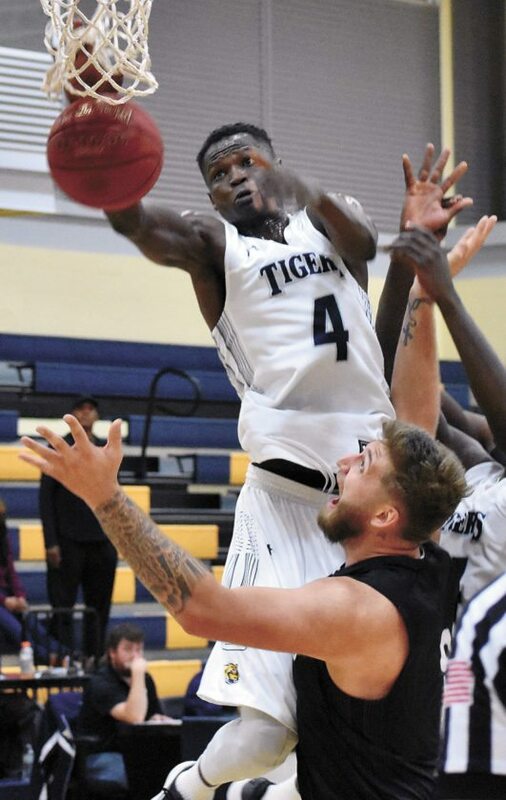 T-R PHOTO BY THORN COMPTON • Marshalltown Community College forward Bassirou Ndiaye (14) attempts to go up with a shot as Little Priest Tribal College’s Tyrese Brown (10) rakes him across the arms during the first half of the Tigers’ 80-70 win over the Warriors on Saturday. 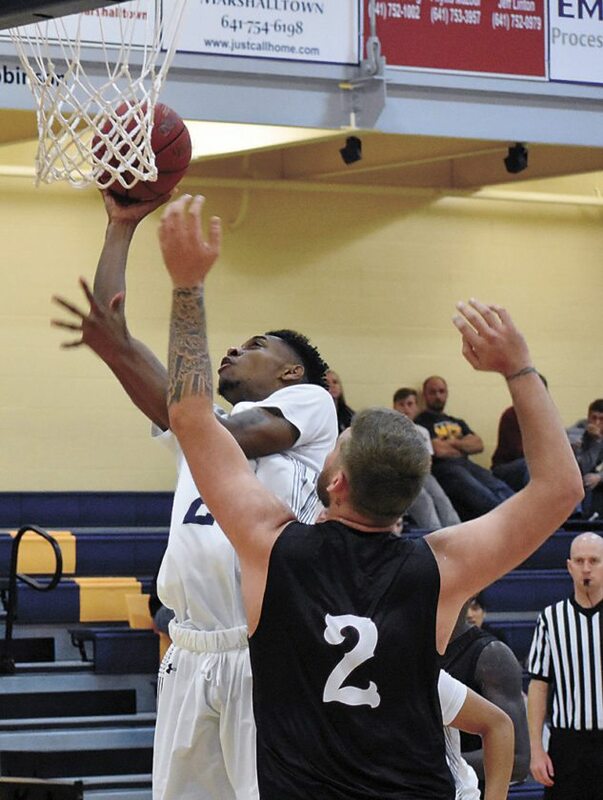 With less than 10 minutes left in the game, the Marshalltown Community College basketball team needed a spark to finish off its comeback over Little Priest Tribal College on Saturday night. The Tigers had fought from behind all night after a slow start, and heading into the final stretch they were down 52-49, better than their halftime deficit of 36-31. 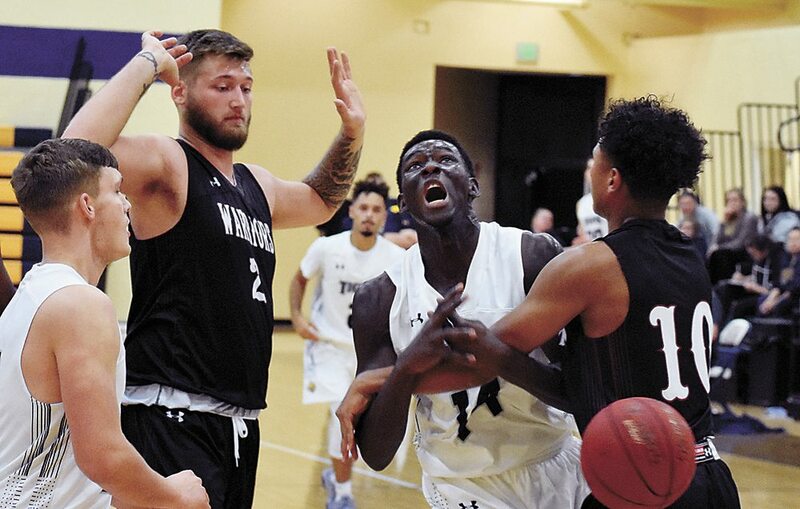 Sophomore forward Mohamed Thiam had already gotten the crowd involved on a couple of electric dunks to reduce the Warrior lead, but it was his work outside the paint that put MCC on top for good. Thiam hit two 3-pointers during a critical stretch, one to tie the game at 55 and one to give the Tigers a 62-55 advantage, and MCC never looked back, taking an 80-70 win over LPTC. Marshalltown head coach Brynjar Brynjarsson said Thiam, who led the Tigers with 22 points on the night despite only scoring two in the first half, came in the clutch when the team needed him most. T-R PHOTO BY THORN COMPTON • Marshalltown Community College sophomore Mohamad Thiam (4) contends for a rebound over Little Priest Tribal College’s Ethan Steinbronn, right, during the Tigers’ win over the Warriors on Saturday. “It was nice to see Mohamed kind of step up and make some plays after a tough first half,” Brynjarsson said. It wasn’t just Thiam who struggled in the first half, all of the Tigers seemed sluggish out of the gates. At halftime, MCC had only hit 13-of-41 shots for 31.7 percent, including a stagnant 3-18 mark on three-pointers. Brynjarsson said his guys weren’t ready to go when the opening whistle sounded, and they have to learn to start games faster before getting into the meat of their schedule. As soon as the Tigers came out in the second half, it was clear the offense had woken up. MCC (4-1) outscored the Warriors (3-3) 49-34 in the second half, something Brynjarsson said was a direct result of getting into the paint. While Thiam’s 20 points in the second half were the major catalyst, freshman guard Javarcus Word was also extremely effective in the second, going for 10 of his 12 points in the frame and snatching down five rebounds, good enough for third on the team. Word said the difference between the first and second halves was the pace that the Tigers were able to play with. MCC generally runs a lot of its offense through Thiam, which causes other teams to focus on him more, something Word said opens up him and the rest of the Tigers to do some damage. Word and the other MCC guards were huge factors in the win, especially in the second half. Juan Coffi and JJ Foster each had two steals during the Tigers run to take the lead and Oscar Kao notched three assists during the spat. Brynjarsson said having four, even five, guys who can contribute from the guard position on any given night makes his team more dangerous. Word said when they work together during practice, the guard group takes pride in improving defensively, something that was on display on Saturday night. Of course the big men were important to the win as well, and not just Thiam. As a whole, MCC out-rebounded Little Priest Tribal College 40-20. Even just five games into the season, the Tigers have shown they can get the job done in multiple ways with multiple people leading the way, and Word said that fact just makes everyone on the team want to improve every day. To keep winning, however, Brynjarsson said the team has to work on how it approaches the game as a whole, because they can’t fall behind early to some of the better competition they will face soon enough. MCC next hits the court on Friday for its first game of the Emerson Classic against Quakerdale Prep Academy, starting at 7 p.m. at the Student Activity Center. LITTLE PRIEST TRIBAL COLLEGE (3-3) — Steinbronn 8-11 5-6 22, Burnside 3-11 0-1 7, Dunlap 1-5 2-4 5, Oliver 7-15 4-5 19, Gresham 3-5 3-3 9, Washington 0-1 0-0 0, Cleveland 0-0 0-0 0, King 0-0 0-0 0, Brown 2-2 0-0 5, Bass 0-0 0-0 0, Yazzie 1-2 0-0 3. TOTALS 22-25 14-19 70. MARSHALLTOWN CC (4-1) — Coffi 2-4 2-3 6, Kao 5-12 1-3 14, Thiam 10-18 0-0 22, Vidovic 0-7 0-0 0, Lane 3-5 0-0 6, Foster 2-3 0-1 4, Word 5-9 1-2 12, Ting 0-1 0-0 0, Ndiaye 3-9 2-4 8, Edwards 1-3 0-0 2, Tony Smith 0-1 0-0 0, Karadan 3-3 0-0 6. TOTALS 34-75 6-13 80. Halftime–LPTC 36, MCC 31. 3-point goals–LPTC 6-14 (Brown 1-1, Steinbronn 1-2, Burnside 1-2, Yazzie 1-2, Dunlap 1-3, Oliver 1-3, Gresham 0-1), MCC 6-26 (Kao 3-9, Thiam 2-7, Word 1-2, Coffi 0-1, Foster 0-1, Ting 0-1, Edwards 0-2, Vidovic 0-3). Rebounds–LPTC 20 (Steinbronn 6), MCC 40 (Thiam 9). Assists–LPTC 9 (Oliver 4), MCC 14 (two with 3). Total fouls–LPTC 15, MCC 19. Technical fouls–LPTC 1, MCC 1.